Established in the year 1997, BLS Institute of Management is a foremost management institution in the western region of Uttar Pradesh. The college is ideally located at Ghaziabad district and boasts of a suitable campus spread across luxuriant land, ideal for imparting quality education. 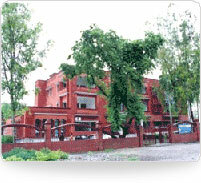 Moreover, it has world class infrastructure equipped with state-of-the-art facilities.BLS Institute of Management conducts postgraduate diploma programme in various streams of management studies, as per the guidelines prescribed by All India Council for Technical Education (AICTE), New Delhi, through a team of qualified teaching staff. Candidates who have passed bachelor degree examination in any stream with minimum 50% marks from a recognized University / College are eligible to apply. In addition, those who have passed examination of The Institute of Chartered Accountants of India or England / The Institute of Cost and Works Accountants of India / England or The Institute of Company Secretaries of India can also apply. Appearing in any of the following entrance tests: CAT / MAT / XAT is must for all applicants.